Describe the contents of each component file. Say you want to build a data display element, independent of a specific object in Salesforce. A good example is the productCard component in the ebikes sample repo. Let’s examine that card component, and build our own version from scratch so you can see how it evolves into a full-fledged Lightning web component. You’ll quickly get the basics when you build up the parts of a component in the Lightning Web Components Playground and explore more samples. A component simply needs a folder and its files with the same name. They’re automatically linked by name and location. All Lightning web components have a namespace that’s separated from the folder name by a hyphen. For example, the markup for the Lightning web component with the folder name app in the default namespace c is <c-app>. You can see this in main.js in the Lightning Web Components Playground. However, the Salesforce platform doesn’t allow hyphens in the component folder or file names. What if a component’s name has more than one word, like “mycomponent”? You can’t name the folder and files my-component, but we do have a handy solution. Use camel case to name your component myComponent. Camel case component folder names map to kebab-case in markup. In markup, to reference a component with the folder name myComponent, use <c-my-component>. For example, the LWC Samples repo has the viewSource folder containing the files for the viewSource component. When the hello component references the viewSource component in HTML, it uses c-view-source. Lightning web component HTML files all include the template tag. The template tag contains the HTML that defines the structure of your component. 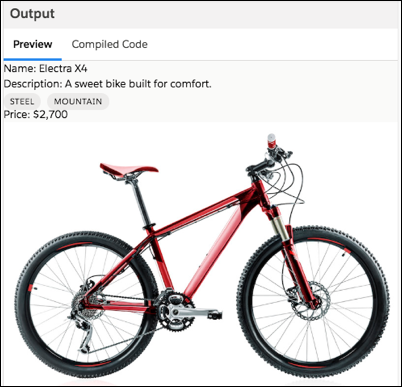 Let’s look at the HTML for a simplified version of the productCard component from the ebikes repo. Follow along by pasting these examples in the Lightning Web Components Playground. Paste this into app.html (replacing any existing HTML in the file). Click Run to see the bike and details. Now let’s say you want to display data, but you know it can take some time to load. You don’t want the user wondering what’s up. You can use if:false and if:true conditional directives within your template to determine which visual elements are rendered. The content in the “display” div tag doesn’t appear until the value of ready is true in the HTML file. Click Run to see the conditional directive working. Now, you don’t want to build all your components from the ground up. So let’s explore using a base Lightning web component. And of course, there are lots of components, including field types, display controllers, navigation items, and more. All of them are listed in the Component Library. Let’s make the details of the bike stand out. To do this, replace the div tags for material and category in the last example with a lightning-badge component. Here's the HTML. The words Steel and Mountain appear as lightning badges. It’s that simple. Bring in the module with the import statement and specify the functionality of the module that your component uses. These two pieces of imported functionality are quite different. LightningElement is our base class for Lightning web components. track is a decorator. We delve into decorators in the next section. @api: Marks a property as public for use in your template or other components. @track: Marks a property for internal monitoring. A template or function using this property forces a component to rerender when the property’s value changes. Use this to store values locally, especially as a user interacts with your component. @wire: Gives you a way to get and bind data. This implementation simplifies getting data from a Salesforce org. But, be aware, apply only one Lightning Web Component decorator to a property at a time. For example, a property can’t have @api (public reactive) and @track (private reactive) decorators at the same time. Respond to any of these lifecycle events using callback methods. For example, the connectedCallback() is invoked when a component is inserted into the DOM. The disconnectedCallback() is invoked when a component is removed from the DOM. We’re moving fast and you’ve been able to try some things out. In the next unit, we take a step back and talk more about the environment where the components live.